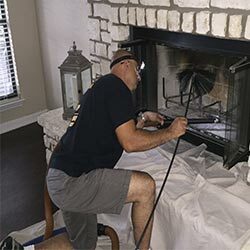 Fireplace and Chimney Cleaners in Austin, TX. WHY SHOULD YOU HAVE YOUR FIREPLACE/CHIMNEY CLEANED? When wood burns it produces unburned byproducts of incomplete combustion. Unburned byproducts travel up the chimney as smoke, some of the smoke going out into the atmosphere, and some of the smoke remains in the inside of the chimney when the gases cool as "creosote". The normal temperature inside a chimney when extracting wood smoke is 300 degrees to 500 degrees. Most people don't know that when high levels of creosote build up in the flue, (the level may be as small as 1/8 inch) and a chimney fire occurs, the temperature can increase to 1500 - 2000 degrees. These amazingly high temperatures can cause flue liners to crack or shatter, metal chimney liners to buckle or split open, chimneys may split open, and the thermal shock created by high temperature can blow bricks out of a chimney. With the capability of the chimney at risk, there is a chance that your home could catch on fire. Many times chimney fires start in the attic where you don't see it until it's too late. Chimney fires can also cause creosote to rise out of your chimney and makes its way to your roof or trees. The best way to prevent a chimney fire and damage to your chimney or home is to have your chimney properly cleaned regularly. The National Fire Protection Association, (NFPA) recommends that if you use your chimney you should have a chimney inspection regularly by a professional, and cleaned upon inspection. Creosote is a natural byproduct of burning wood. As the smoke goes up your fireplace chimney, creosote remains in the inner walls of your chimney. Creosote is highly flammable and causes many chimney fires in homes. Removal of creosote is imperative for continuous safe use. The best way to remove creosote is by using chimney sweeps. Standard and mechanical fireplace chimney sweepers address your flue liner, smoke chamber, smoke shelf, damper, and firebox. 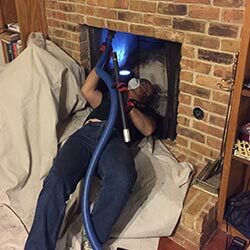 Furnace chimney sweeps are also known as furnace flue cleaning, chimney liner sweeps, or furnace chimney cleaning. Furnace chimney sweeps are primarily for integrity purposes, cleaning, and obstruction free assurance. Your gas burning unit emit carbon monoxide and deposits to the atmosphere through your furnace chimney flue. 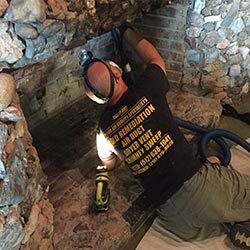 Professional Chimney Cleaning service, with an inspection, removes these corrosive deposits and ensures safe & efficient exhaust escape from your home. Many people die each year from carbon monoxide poisoning which are ultimately caused by toxins in the ventilation of their homes. Carbon monoxied poisoning is also caused by toxis gases emitted from their heating systems. Having chimney sweeps done regularly can save many lives. Fireplace smoke could be harmful if emitted from the wrong area of a fireplace. There are so many possible causes for a smoking fireplace that you can spend a ton of money guessing what the problem is. Most of the time all that is required to take care of the problem is a good chimney and fireplace cleaning. You should clean your chimney in between every season. This will keep hazardous creosote from building up in your flue and also help your fireplace draft better. It will reduce smells in the summer time and eliminate the potential for dangerous chimney fires.